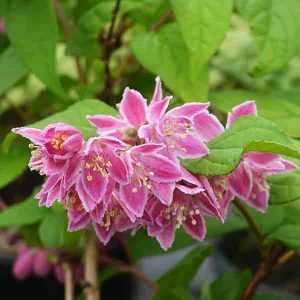 An old hybrid from France, Deutzia magicien is small bushy shrub with very attractive pink flowers. The flowers appear a musky pink buds, opening to a strawberry pink and white flower. Better formed than the flowers on some other Deutzia varieties and very attractive. Although the flowers are the main feature, the autumn foliage at the end of the season is an attractive deep red. Over time, Deutzia magicien will reach around 1.5 to 2 metres in height. Foliage is a good bright green, lanceolote in shape. A Lemoine hybrid that has been in cultivation since 1925. It has a dense growth habit, upright in good light and arching stems on a mature specimen. Bees love it, and it is long flowering. Best grown in a humus rich and well drained soil. Good morning sun is important, with perhaps a little light afternoon shade especially in warmer climates. This is a fairly slow growing plant and will benefit from regular applications of liquid fertiliser through the growing season. Mulch around the base of the plant in early spring, with a little added cow manure at this time as well. The mulch helps retain a cool root run as well as moisture.